Aromatherapy is a caring, hands-on therapy which seeks to induce relaxation, to increase energy, to reduce the effects of stress and to restore lost balance to mind, body, and soul. My name is Kelly Smith, owner & alchemist of Botanic Synergy LLC, established in 2016. i am a certified clinical aromatherapist that formulates & manufactures wellness, bodycare, & energetic products to spread the art and awareness of aromatherapy. I am a proponent of sustainability & environmental protection, so i steam distill locally grown, organic botanicals to produce some essential oils and Hydrosols. In 2018, I completed a Clinical Aromatherapy Certification with The Institute of Spiritual Healing and Aromatherapy. ISHA was founded in 2004, and has been on the forefront of accredited Aromatherpy and healing arts educational programs. Their Clinical Aromatherpy Certification Program is accredited by The National Association of Holistic Aromatherapy. I am a member of naha, & am registered as a level 3 clinical aromatherapist. I am also an alumni of UNCW, as I received a B.S. in Marine Biology in 2007. My education gives me a deep understanding of the healing power of essential oils. Many hours of botany, chemistry, biology, anatomy, physiology, & other life sciences give me a scientific approach to aromatherapy. 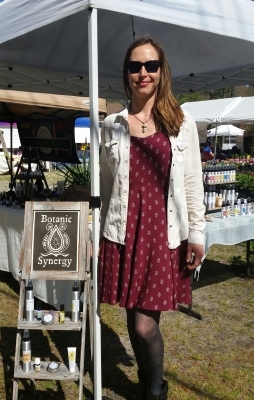 I have also gained 7 years of experience in the aromatic industry, as I managed an apothecary business in the downtown Wilmington area, called Down To Earth. I learned so much there, as i made products to stock the store with the owners recipes, and created hundreds of custom formulations for individuals & businesses. You might recognize some of my perfumery creations around the Wilmington area, like Valkyrie, Coffee & Cigarettes, & Call Me, among others. My previous experience, along with my continued education, have inspired all the creations that I offer through Botanic Synergy LLC. Not only do I provide quality aromatherapy products at farmers markets & pop up events through out the southeast, I also create custom formulations for individuals and businesses, & teach classes. Please consider aromatherapy to promote your physical, emotional, spiritual, & energetic wellness needs. The customer is always right!! Feedback on all products & customer experiences are welcomed. Expect up to 5 days for processing of an order before it is shipped. There are no returns of purchased products, unless the return is due to an issue with packaging or an error on behalf of the business. Inquirie about wholesale information or custom formulation by email, please. Pretty please, do not ingest any products from Botanic Synergy, & keep out of reach of children. Botanic Synergy LLC will not be held liable for accidents or adverse reactions resulting from improper use of these products. If an essential oil or blend is accidentally ingested, you can call the The United States National Poison Control Hotline at 1-800-222-1222 for assistance. Although these products are intended for therapeutic use, they are not approved by the FDA to be used in place of pharmaceutical medications. Consult a physician before use if you have health concerns, are pregnant, epileptic, or for possible contraindications or allergies with these products. All product labels have information conveying any cautions for use. Quality Essential Oils are the foundation of effective aromatherapy treatment. The rising popularity of aromatherapy is putting an ecological strain on plants used to extract many of the healing oils we use every day. As a responsible Clinical Aromatherapist, the preservation of the tools of my trade are important to me. As are the quality, affordability, & environmental impact of my products. In an effort to support local farmers & sustainability, I source the botanicals I use from local growers who practice organic & ecocert protocols. Upon the blessing of procuring bulk botanicals, I steam distill them to obtain essential oil & hydrosol. Filtered spring water is used in every distillation, & the water used to cool the condenser goes through a recirculation system to minimize water waste in the lengthy process. I use different distillation units, depending on the botanical being extracted. 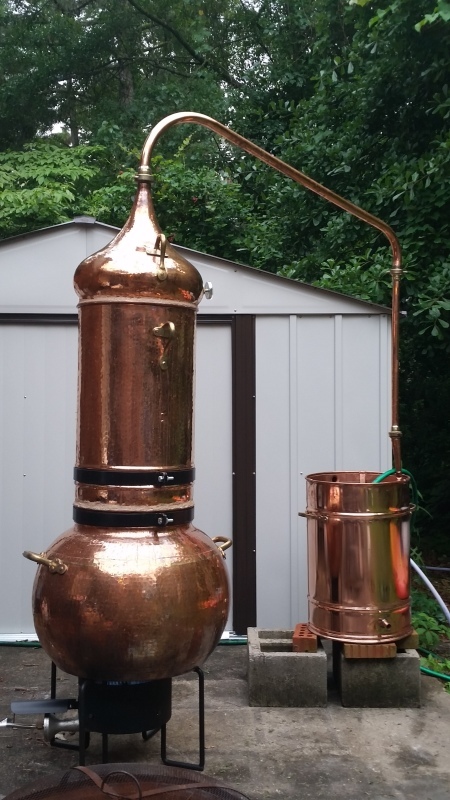 Pictured to the right is my copper alembic, but stainless steel & glass systems are also utilized. What ever essential oils I do not make myself, I source from wholesale companies that test each batch to ensure they meet organic & ecocert standards.